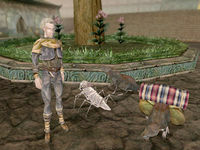 Description: Being one of the three living gods in Morrowind, she is acting behind the scenes and requires your help, involving you in an epilogue of the Temple history. 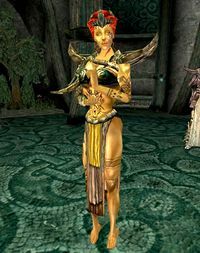 Quote: Effe Tei: "Almalexia is one of the gods worshipped by the Dunmer in the Tribunal Temple. She's known as the Healing Mother and Lady of Mercy, the source of compassion and sympathy, and protector of the poor and weak. She's no tender-hearted powderpuff, though. She's an important symbol of Dunmer independence to those who resent the Empire, and the Hands of Almalexia—her personal guard—enforce a strict adherence to Temple doctrines." Resistant against: Almost Everything (See Below) . 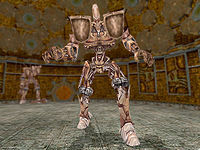 Description: A large artificially constructed creature, guarding the entrance of Sotha Sil's quarters. It attacks on approach, using far ranging electricity spells and engages in melee with kicks and punches. 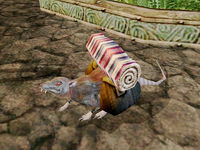 Description: Scrib, Rat and Pack Rat can be purchased from Rerlas Mon, a merchant who can be found outside in the Great Bazaar. The prices are non-negotiable. Up to 6 of each type of pet can be purchased, though no more than one of each at a time. Quote: Latest rumors: "Packrats. Really. You think I'm kidding. But Rerlas Mon is selling them in the Great Bazaar. You'd be surprised how well-trained they are, and how much they can carry. Cheap, too. And in a tight spot, they're pretty good for stew." The scribs will follow you anywhere, and can help out by paralyzing your opponents. The rats can be given simple commands to "Come" or "Stay". Pack Rats, in addition, can carry up to 100 lbs. of equipment for you. None of them are particularly effective in combat, as they do very little damage, and one hit from almost any creature found in the Tribunal expansion is enough to kill them. The Pack Rat is by far the most useful, but only if you're careful about ordering it to stay back when you go into combat. If a Pack Rat has any magical scrolls in their inventory, they will use them when engaged in combat. This page was last modified on 25 February 2019, at 23:51.